April 11, 2018 (Jacumba Hot Springs) – You’re invited to celebrate Earth Day at the Desert View Tower in Jacumba Hot springs on Saturday, April 21st from 8 a.m. to 6 p.m.
You can participate in a land blessing and Native American drumming with Grammy award-nominated Chief Windwalker, plus enjoy a native plant sale, coil-pottery and basketry demonstrations, face painting, tie-dye clothing, desert hikes, In-Ko-Pah yoga in nature, Reiki energy healing, intuitive tarot and spiritual counseling, palmistry, essential oils, crystals, herbs, jewelry, geodes, books, gifts, a nature photography contest, and organic gardening. April 2, 2018 (San Diego's East County) - The County of San Diego seeks volunteers to help plant thousands of trees in celebration of Earth Day during April, helping to replenish the tree canopy at parks across our region. Additional activities are also planned to restore the health and natural beauty of our parks. April 22, 2016 (New York) -- Leaders from 150 nations are gathering in New York today, Earth Day, to sign the historic Paris Agreement, a coordinated global effort to reduce climate pollution. April 20, 2016 (Sacramento) -- The United States needs to make a major course correction on environmental issues according to Interior Secretary Sally Jewell, who spoke Tuesday to the National Geographic Society in Washington. April 20, 2016 (Santee) -- An Earth Day Community Mural project is being launched in Santee at the Walker Preserve this weekend. Volunteers are needed to help pain a series of six murals at the Magnolia Avenue underpass along the San Diego River starting Friday, April 22nd through Monday, April 25th from 9 a.m. to 4 p.m.
April 19, 2016 (San Diego) – As citizens around the world prepare to commemorate the 36th anniversary of Earth Day this week, signs of climate change are increasingly evident on a local and national scale. May 2, 2015, 2015 (SDSU Montezuma Hall) - The Conrad Prebys Student Center at San Diego State University was filled on Earth Day, April 22, as Winona LaDuke took the stage dwarfed by the giant screen depicting the past splendor and future possibilities of her native White Earth Nation. In the language of the Anishinaabe she brought greetings and recounted the Ojibwa names for the months or moons noting that not one of them was named after a Roman Emperor. March 28, 2014 (Santee)--Hundreds of students in the City of Santee will be lacing up their sneakers and securing their bicycle helmets on Tuesday, April 22nd in celebration of the first ever citywide Walk to School Day. 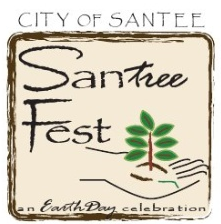 April 21, 2013 (Santee) – What began eight years ago as Santee’s homegrown observance of Arbor Day and Earth Day has blossomed into an all-day extravaganza named SanTree Fest. This year’s daylong festival will feature more booths, more free activities for children, and more entertainment. April 20, 2013 (San Diego) – In honor of this year’s Earth Day on April 22, take action to make your home a hub of energy-efficient practices. “Going green” is no longer just the catch phrase of environmental advocates, celebrities and politicians. Now, you and your neighbors are empowered to make environmentally friendly changes to your home to address the growing concerns of a shaky economy, increasing energy costs, and our ever-dwindling natural resources. April 13, 2013 (San Diego) – Echo Eden along with community partners San Diego Loves Green, Live Fit Films, Regenerative Homes and Heartland Coalition announce the Earth Day Food Forest Campaign in San Diego. Together these organizations have come together to help launch the first phase of a new regional community garden initiative that they are spearheading for the San Diego region. Community members are invited to do something meaningful this Earth Day and support this project by buying a 5' to 7' fruit or nut bearing tree that can either be planted in the first of its kind Food Forest or in your own yard. April 12, 2013 (Mt. Helix) – The Fourth Annual East County Earth Day, a free, family-fun event, will be held at Mt. Helix Park and Amphitheater on April 14 from 11 a.m. to 3 p.m. Co-hosted by The Jarrett Meeker and Mt. Helix Park Foundations, East County Earth Day will feature eco-friendly vendors, live music, speakers, an art contest, wildlife presentations, an Earth Day scavenger hunt and games for children. Vendors include Birch Aquarium, The California Wolf Center and I Love A Clean San Diego with interactive environmental and wildlife presentations. April 21, 2012 (San Diego) -- To help celebrate Earth Day 2012 the Environmental Protection Agency has a number of activities that anyone can take part in. Ideas include a photo project and an essay contest among others. April 12, 2012 (Alpine) – The Alpine Chamber of Commerce is holding its “I Love a Clean Alpine” event on April 14 from 8:30 a.m. to 4:30 p.m. The event begins at the Triangle, 2157 Alpine Blvd. with a free continental breakfast. Vests and bags will be distributed for cleaning up Alpine Blvd. and Wrights Field. At noon lunch will be provided. March 27, 2012 (La Mesa) -- The third annual East County Earth Day, a free family event, will be held at the Mt. Helix Amphitheater on Sunday, April 1 from 11 a.m. to 3 p.m. Co-hosted by The Jarrett Meeker Foundation and Mt. Helix Park, East County Earth Day will feature vendors with interactive environmental and wildlife presentations. Educational speakers, music, food and children’s activities will make the day complete. April 22, 2011 (The World) – Happy Earth Day! This year, organizers are encouraging people around the world to help create “ A Billion Acts of Green” – actions of environmental service and advocacy aimed at preserving our environment and our planet. April 13, 2010 (San Diego’s East County) – The first annual East County Earth Day will be held on Sunday, April 25 from 11 a.m. to 3 p.m. in the ampitheater on the top of Mt. Helix. In addition to learning about sustainability and eco-friendly practices, visitors can enjoy live music and presentations ranging from falconry to aquatic animals. Learn How to Weather the Water Challenge at Earth Day April 19 By Sylvia Hampton April 1, 2009 (San Diego)--San Diego County’s biggest environmental challenge is WATER. We live in a desert but act like we live on a tropical island. Our supply is decreasing while our population is increasing. Climate Change is not helping. When we bought a new home in 1996, my husband and I were told we had to have a grass lawn or we would be in violation of the code of conduct for Scripps Ranch residents. Our neighbor across the street ignored that and put in a smart drought-resistant landscape.